DODD (Dods), ARCHIBALD CHARLES, lawyer, office holder, politician, and judge; b. c. 1740–45, probably in Northumberland, England; buried 7 June 1831 in Sydney, N.S. Local tradition in Cape Breton relates that Archibald Charles Dodd was born into a wealthy family and was raised at Tofthouse, Northumberland. He is moreover alleged to have lost his inheritance, an event which forced him to become a lawyer. In 1775 Dodd married a woman named Bridget, who, he later claimed, was a bigamist. She in turn stated that he had left her when her money was gone and that after she had refused his proposals for divorce they had agreed on his paying her an annual allowance. 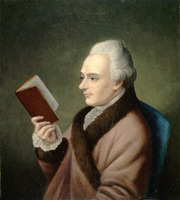 Between 1783 and 1787 Dodd worked in London as a lawyer, representing the interests of loyalists and negotiating to purchase army commissions for wealthy clients. During one such transaction for Captain Edward Pellew, later Viscount Exmouth, money was misappropriated, and though Dodd later claimed that he was innocent his reputation was probably hurt. It was therefore to escape a clouded past that in 1787 Dodd arrived in Cape Breton, which three years earlier had been separated from Nova Scotia as a distinct colony. Since he was one of only two lawyers there (the other being Chief Justice Richard Gibbons*), he was immediately engaged by Lieutenant Governor Joseph Frederick Wallet DesBarres as acting clerk of the Executive Council, the governing body of the island. In 1788 Lieutenant Governor William Macarmick* appointed Dodd his private secretary, and on 8 July of the same year Dodd married Susannah Gibbons, daughter of Richard Gibbons; the couple were to have 11 children. Dodd’s acumen was revealed not only by his marriage, but also by his ability to adapt to shifting political alliances within the colony. One faction headed by the attorney general, David Mathews*, was opposed by another headed at different times by Gibbons and the Reverend Ranna Cossit*, and though Dodd was identified as a member of the latter body during DesBarres’s term, he kept a low profile. Appointed to the council in 1789 by Macarmick, he was careful not to upset the unanimity which prevailed there once Mathews’s faction had become predominant, and he therefore acquired the friendship of Mathews. 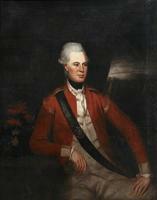 The latter became administrator of the colony after Macarmick’s departure in 1795 and made Dodd his private secretary. Then on 14 June 1797 Mathews appointed him first assistant judge of the Supreme Court, an act that apparently suspended Ingram Ball*, who had been serving as chief justice. That spring Dodd had become personally involved in the controversy between Mathews and his opponents. Angered by allegations from the wife of William McKinnon* that he had accused Cossit of robbery and sacrilege, in an uncharacteristic loss of control Dodd attacked the McKinnons in personal terms. McKinnon then challenged Dodd to a duel, which through Cossit’s intervention failed to take place. Dodd’s importance waned when James Ogilvie* replaced Mathews as administrator in June 1798, since Ogilvie blamed Mathews for the colony’s problems. Ogilvie used the McKinnon incident as an excuse to force Dodd’s resignation from the council on 3 July, and that summer he was replaced as chief justice by Ball and William Smith*. The eclipse was only temporary, however, since Ogilvie was in Cape Breton for less than a year. His successor, John Murray, tried to end the factional quarrels by naming members of both groups to the council; thus Dodd received an appointment. Within a few months of Murray’s arrival, however, Mathews was questioning his authority. Murray, a stern and exacting military figure, would brook no opposition and dismissed Mathews as attorney general. When Dodd attempted to defend Mathews he was dismissed from the council on the grounds that he had packed juries during his term as chief justice. Two events in 1800 marked a turning-point in Dodd’s fortunes: the death of Mathews and the arrival of John Despard. The former lessened the bitter factionalism that had affected the lives of many of the colony’s officials, and Despard’s term as administrator saw Dodd attain a position of importance. Not surprisingly, Dodd warmly supported Despard in his struggle to force Murray to hand over power, and after Murray was ousted he was rewarded with reappointment to the council. Dodd soon became Despard’s confidant and received commissions as deputy surveyor of woods in 1803 and, at the death of William Woodfall in 1806, chief justice. Soon after the last appointment, however, Dodd and Despard fell out over the legality of the tax on imported rum, which Despard had been allowed to levy by a Treasury decision of 1801. The tax was opposed by Richard Collier Bernard DesBarres Marshall Gibbons, son of the former chief justice, and by 1805 Gibbons was arguing that any tax was illegal unless approved by parliament or a local house of assembly. Gibbons’s solution was to establish a house of assembly, which had not been set up when the colony was founded because of its small population. Dodd had at first opposed his brother-in-law, but as chief justice he seems to have become sympathetic to his arguments, and in 1806 the two men, hitherto enemies, became confidants. Despard’s dislike of Gibbons caused his alienation from Dodd and in May 1807 he dismissed him from the council. He could not, however, circumvent Dodd’s official appointment as chief justice by the British government, which had taken place the previous year. Nicholas Nepean, who succeeded Despard in July 1807, soon reappointed Dodd to the council. Like Dodd, Nepean was convinced by Gibbons’s arguments, and he let the tax lapse. But as Dodd settled in as chief justice he took a closer look at the legality of the tax and concluded that the crown did indeed have the right to impose a duty of this type in a colony such as Cape Breton unless otherwise directed by the House of Commons. He was also not as sympathetic to an assembly as he had been previously because he foresaw that his power would be diminished under a representative government, and he seems to have fallen out with Gibbons. Because Nepean and Gibbons had become allies, in 1812 Nepean dismissed Dodd from the council, on the pretext that his original distrust of Gibbons had been fostered by the chief justice. However, Dodd’s stand kept him in good stead with Nepean’s successor, Hugh Swayne*, who was not interested in constitutional niceties; after he arrived in January 1813 he promptly reinstated the rum tax and reappointed Dodd to the council. In 1812 Dodd’s life had been disrupted when his past caught up with him. His first wife suddenly reappeared in England, charging that he had deserted her, and Lord Exmouth accused Dodd of having swindled him. Dodd refuted the charges, in which, he suspected, Nepean and Gibbons were involved, but Swayne was obliged to suspend him as chief justice. In July 1813 he went to England to answer Exmouth’s accusation, and remained for three years. He maintained that he had lived in London for two years after Exmouth’s money had disappeared, and though Exmouth had known of his presence he had not laid charges. Indeed, Dodd claimed, both his agent and Exmouth had professed their belief in his innocence. Exmouth failed to bring the case to court since he was on duty in the Mediterranean for most of the period. Lord Bathurst, the colonial secretary, therefore simply lifted Dodd’s suspension. Dodd’s first wife presented a petition in 1818, but nothing seems to have come of it. The chaos on Cape Breton had stimulated the British government into considering the reannexation of the island to Nova Scotia. With the occurrence of famine in the summer and fall of 1816, Henry Goulburn, under-secretary in the Colonial Office, advised Bathurst to avoid allowing a house of assembly because of the poor condition of the colony. In the mean time, following Dodd’s decision Gibbons had maintained that all ordinances passed by the council were unconstitutional since no assembly had ever been called to pass them. Bathurst submitted this argument to the English law officers, and in April 1818 they reported that Gibbons’s opinion was correct. Faced with this dilemma, Goulburn recommended that the colony be reannexed to Nova Scotia and that two members from Cape Breton be summoned to the Nova Scotia House of Assembly. 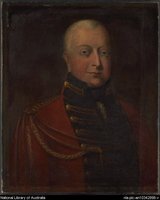 Early in 1819 Lieutenant Governor George Robert Ainslie* was secretly informed of the decision to reannex, and by the summer it had become common knowledge. 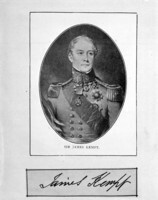 Despite protests, on 16 Oct. 1820 Lieutenant Governor Sir James Kempt* of Nova Scotia proclaimed the end of the colony’s existence in Sydney. Dodd himself was retired on full pension, a measure of the respect the Colonial Office and Halifax had for him. Although no longer employed, he continued to lead an active life, and died as the result of injuries received by a fall from his horse. On the day of his burial all businesses in Sydney were closed and ships in the harbour flew their flags at half-mast. Dodd played a key role in the history of the colony of Cape Breton. In his long career he influenced the thinking of every lieutenant governor or administrator, and his decision as to the illegality of the rum tax led directly to the colony’s reannexation to Nova Scotia. He and his family were very influential in Cape Breton society for over 150 years. His son, Edmund Murray Dodd*, was Sydney Township’s first elected representative, became a leading tory mha and executive councillor, and later served as a puisne judge of the Supreme Court of Nova Scotia. In turn, his son, Murray Dodd, became a Conservative mp for Sydney and then a judge before his death in 1905. R. J. Morgan, “DODD, ARCHIBALD CHARLES,” in Dictionary of Canadian Biography, vol. 6, University of Toronto/Université Laval, 2003–, accessed April 22, 2019, http://www.biographi.ca/en/bio/dodd_archibald_charles_6E.html.